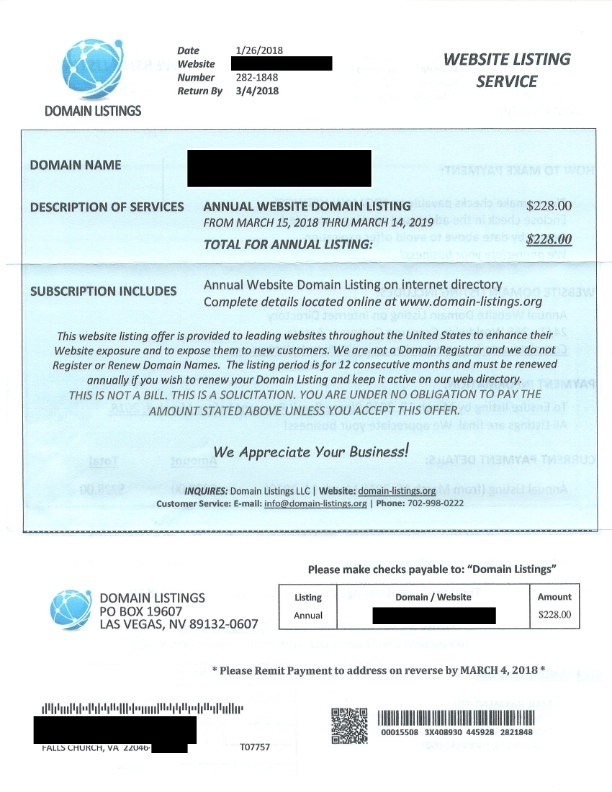 A client received the domain name scam below last week. This solicitation is similar to scams targeting trademark owners – it looks official and it is has zero legitimate value. An “Annual Website Domain Listing on internet directory” — so what? No one uses or needs such directories (unless they are selling spots for money). The cost of $228.00 provides no actual value that I am aware of. We just received on in June 2018; thanks for your post. It has now been placed into our shredder. We received the same bogus letter today 7/23/18! Please spread the news of this blatant and disgusting practice by this company! They will be facing certain legal demands shortly! We received same letter today Sept 24 2018. Well there out with another round, received the letter today, luckily, owner checked with me (Internet Marketing Director) and caught it. Received this letter today 12/14/18, so they are still at it. Beware! I also just received this solicitation. Thanks for your post! We also just received on 6/26/2018. Thank you! Just received this letter 7/9/18. Thanks for posting about it. We received this invoice dated 05/03/2018. Definite scam! Thank you very much for posting this! Thank you for posting!!! Our company also received this same invoice dated 5/26/18!! We just received an invoice today, July 17, 2018 and I was suspicious so I googled and found your post. Thank you for sharing! Thank you for your post. I received the same “invoice”. I wish there was more protection from companies like this that scam folks out of their hard earned money. Well you know what they say about Karma…. Thanks again and God bless you. We just got our “invoice” in the mail today, and literally right after I got off the phone with our actual web domain provider, so thank you so much for the heads up! I hope no one truly falls for this scam!! Thank you for you post. 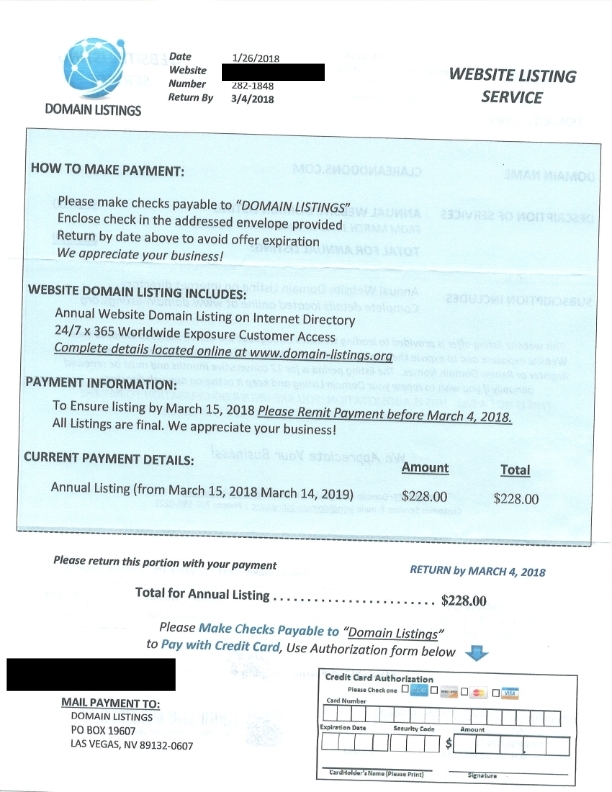 I just received the exact the same invoice from Domain Listings just now. I was suspicious about this invoice cause I know that our company have never dealt with them in the past so I googled the company and found your post. Thank you so much greatly appreciate it. Received one as well on 8/21/18. Throwing it away. Thanks! Just got this letter today. You can’t trust anyone anymore. Our business got one of these letters. I filed a complaint with BBB.org and FTC.gov for deceptive and scam-y marketing practice. Report them to agencies where you can. Scammers gonna scam, I guess. I just got one today 9.5.18. Glad I Googled it. We just received the same and, since I’ve never heard of them, I decided to check our records. Then I immediately did a search and found this scam warning. Boy, am I ever glad I did. I just received a letter to as well. 9/10/18. Thank goodness for google. I work for an internet hosting company and a lot of my customers get this letter! Please do not fall for it! Received it & saw this post. Disregard it. My question is since it is a scam and a PO BOX to mail. Why no action taken and arrested made ? I am pretty sure the PO BOX in under a company or person’s name. Can it not be trace ? Unfortunately, the letter clearly defines what the payment is for and that they are not a Domain Registry. Our Treasurer did not read it well and sent the payment in. My company also received one of these “invoices”. Thank you for posting. This was sent to the homeless shelter where I work and we almost paid it (staff turnover, etc. led to new staff not even realizing this was NOT our legit vendor). Obviously they have no reservations about who they send one to. Recieved one today at the Sheriff’s Office ! Please keep passing the word about these scams. We just received the same letter today. How is this legal? Our church just got ours. So glad I decided to research this before I paid! Thank you for keeping us informed! Thanks to your post we also escaped paying these scam artists! Their invoice looks legit! We received one today on 10/23/2018 as well. We received this today as well. DO NOT PAY…. It does state it is an offer, beware!!!!!!!!!!!!!!!!!! I just got the letter and invoice today. I knew something was up, when they are not the people who host my domain. It does say right on the letter that you are under no obligation to pay and that its a solicitation. Received on 10/30/18 – there still out there! Got one 10/15/2018. How can we report this (outside this site)? Thanks so much for your warning! We received one today, 11/21/18. Also just received the same “invoice”, 12/3/18. Thank you for the post! I knew we had never paid this company before for our listing so I Googled and your post came up. Received ours 12/3/18 for services for 2019. BEWARE for sure! Looks very legit so could pass through and get paid! Received one 12/7/18. Clearly the complaints filed at BBB aren’t doing anything to hinder this “business”. Thanks for the heads up. Just received this today. Glad to have found this blog to help out on this. THESE PEOPLE SHOULD DO SOMETHING PRODUCTIVE LIKE DO SERVICE TO THE HOMELESS, OR PICK UP TRASH IN THE FAST LANE ON THE FREEWAY. I received this 12/14/18 as well – thank you for providing this information. It was very helpful! Received one today. Thank you! I just received this in the mail, I am glad I found this. Thank you! Thank you for posting this information. I received this same letter 12/20/18. Our company received this Jan 2019. Thank you for this post. I’m a little new to the job and was unsure whether it was legit or not. Our company got one today. I never heard of this company. Thank you for posting this. This is second scam our company has received. I just got one. Thank you!! received this yesterday. Never heard of the company so i did not approve the payment. Googled it and the first result came up was “domain-listings.org scam” and here i am. People need better things to do! Thanks for posting this online! We just received this letter today. I knew that this company did not host our website, but a quick google search led me here, so thank you for warning people about this! Anything we can do to shut these people down? my company received one as well and i was skeptical to pay. I recall communicating with a rep that maintains our domain back in 2018 so i was surprised when this came in. I almost pay but my instinct wanted me to search online. Thank you so much. Shredder here i come! received the same scam letter today….The greedy dollar amount was also a red flag. Please send these scammers an expensive message ! Received the same scam letter today. Looks like the BBB is not doing its job. Into the shredder. Glad I looked this up. Thank you so much for your post, we just received one as well. We received the letter on 2/15/19. Thanks for the information! It saved a lot of time, trying to determine the legitimacy of the letter/invoice. received same letter 2/19/19.. thanks for posting about this – my husband thought it was legit! makes me sad that a lot of people probably fall for this one. Ive being trying to stop this forever….where can I send this garbage! Thanks for this posting, very timely and informative. Pls keep it up! Thank you. I received a similar notice a few weeks ago and was dubious of it. Your post just confirmed my suspicion. Yep, we just got one too..
It’s a great scam for the thieves that are send this crap out. Maybe it’s time we send some ‘crap’ back to them. Just got one today – looks so official, so glad I am suspicious nowadays of any solicitation by mail. Have had this domain since. Net came into play for non profits. Received this trash today. They are still at it. What a low life no good XXXXXX. I have been having my website for over 10 years so I didn’t fall for it. It has SCAM written all over it. We received the letter on April 11 and was dated March 8 and it said it was due April 14/19! what a scam! I’m glad I checked before paying to these thieves! Just received this letter, as well. I was doing some research and found this post.